Despite numerous initiatives to tackle educational inequalities and encourage social mobility, little has changed in the past 50 years. Here, Dr Carol Fuller, Associate Professor at Reading’s Institute of Education invites you to join her at a symposium in Westminster on 27 February which she hopes will help change the way policy-makers think about education. Our research shows that activities that build confidence, resilience and self-efficacy outside the classroom can make a real difference in the classroom. But despite a wealth of evidence and research, activities like these are not part of the formal curriculum. And education policy-makers remain transfixed with attainment figures and grades. 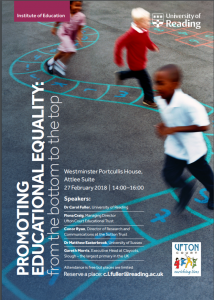 On the 27 February, I will be joined by education experts and practitioners at a symposium in Westminster to figure out why the educational attainment gap between “the haves” and “the have nots” shows no change. 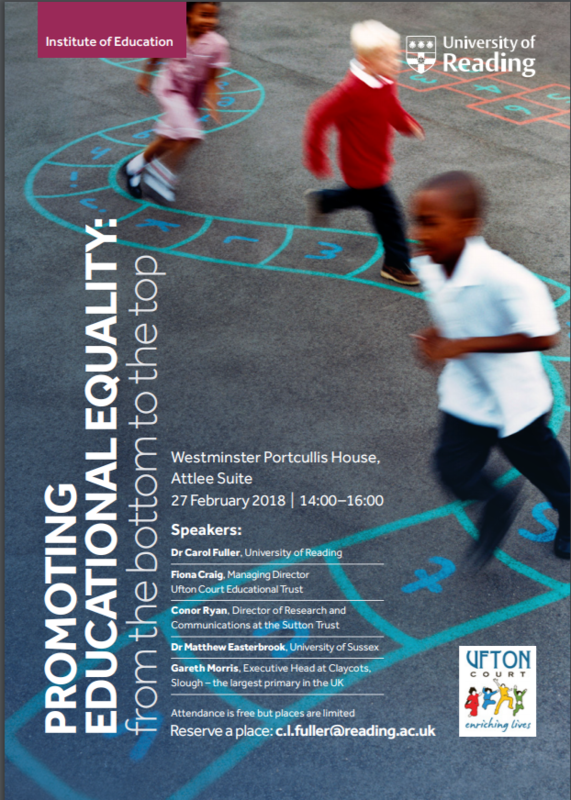 My aim for this symposium is to start a much needed conversation as to the role and purpose of education in promoting greater educational equality. I also want us to start a discussion on the longer term social impacts of the current UK system; a system that prioritizes academic performance over other essential knowledge and skills. The key focus for this symposium will be a discussion on how best to promote greater equality via a bottom up approach to education. We hope to show that a more holistic approach to learning, through activities such as resilience building for example, could not only improve educational outcomes, but would also support mental well-being and the character traits need to succeed in education, adulthood and society more generally. The 21st century poses particular challenges for our young people, not least in terms of their stress and mental health. We hope to show that only with a systemic shift in how we approach these challenges can we hope to have an educational system that is not only fairer, but is also better meeting the needs of our young.